Yesterday: A Perfect Winter Day! 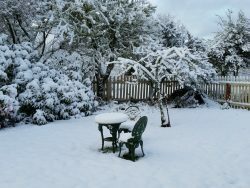 We woke up to a frosty white world – five or six inches of snow blanketed Oysterville. And, by mid-morning the sky was blue and here we were surrounded by a winter wonderland! Perfect! 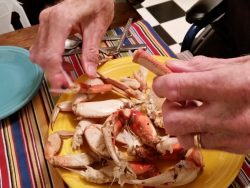 For dinner – two of the biggest, sweetest, fullest Dungeness crabs you’ve ever seen! The bounty of Willapa Bay, brought to us ‘on the hoof’ by a crabber friend and cooked on a hot plate in our kitchen garden following my grandmother’s recipe of a hundred years ago. They were perfect! Truly, winter days don’t get much better than yesterday was! Not for this former California girl who isn’t a fan of freezing weather and snowy sports. But… truly, the day was a feast from beginning to end and I think I’m good now, at least winter weather-wise. I hope Punxsutawney Phil is right – an early spring! As for the crab part – I wish our local crabbers a long and fruitful season! I, for one, could manage a dinner like last night’s many more times before those pesky quotas are reached. Absolute perfection!